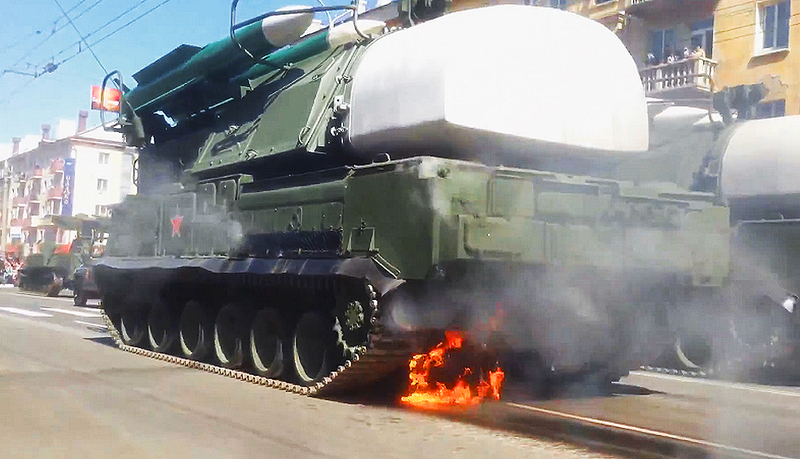 As Victory Day celebrations swept across Russia yesterday, in the city of Chita a SA-11 “Buk” surface-to-air missile system caught fire while parading through the city’s streets. Not exactly an ideal scenario in a tight urban area surrounded by other vehicles, people, and uh... possibly live missiles. The SA-11 became notorious after one of them shot down Malaysian Air MH17 over Eastern Ukraine last summer. As such, their appearance in Moscow’s Victory Day parade this year made for some lively comments during the live streaming of the event on YouTube.